It’s kind of funny to look back at your high school self where the smallest thing like getting a major pimple breakout could seem like the end of the world. The fact that you felt that your parents couldn’t possibly understand because seriously they were never a teenager in your eyes. The dramatics of a teen are hilarious to me now and I was not really a dramatic teenager, at least I didn’t think I was in the sense that everything was constantly the end of the world. I did well in school, I was in dance classes in all of my free time, and the little free time I had I would hangout with my friends. As a teenager I was really into pop-punk and punk-rock music. Granted I also listened to a lot of pop music as well, like Britney Spears, Backstreet Boys, and N’SYNC, but I loved the thrashing beat of the drums, the bass pumping the song loudly into my stereo speakers, and the guitar solos the escalated the power of the song to a climax. The early 2000s were a growth and comeback period for guitars. You had artists like Blink 182, Simple Plan, Fountains of Wayne, Bowling for Soup, American Hi-Fi, and Green Day gain a huge following and popularity. Simple Plan released their debut album in 2002-2003 called “No Pads, No Helmets…Just Balls.” Firstly, the title of this album is amazing. It explains all the thoughts that you think as a teenager. Life is just one big dodgeball game and you are constantly getting pelted without padding. I don’t know if that was their intention of the title of the album, but I remember laughing at the album cover art when I got the album where it just showed one giant out of control frat party. This album sold over a million albums in the United States and over four million copies worldwide. These kind of numbers are unheard of today with the changing of music industry, but these numbers really shows the popularity of this group. This pure pop-punk record had four major hits from it – I’m Just A Kid, I’d Do Anything, Addicted, and Perfect. Perfect is one of my favorite songs off this album. It reminds us that parents have such a huge impact on a kid’s life. What you do. What you say. It means everything to a kid. How you think of them. Your reactions to their successes and their failures as well as their goals and aspirations. Even as an adult their opinion still matters. All you late 1990 and early 2000 babies I am about to educate you. Fountains of Wayne and Bowling for Soup are not the same artist! Stacy’s Mom – RIAA Gold Certified and Grammy Nominated song was done by Fountains of Wayne. For all you parents yes this song is majorly inappropriate, but what song has ever actually been appropriate from the punk genre? Bowling for Soup catalog includes songs like 1985, Almost, and my personal favorite Girls All The Bad Guys Want. Girls All the Bad Guys Want was released in 2002 and was Grammy Nominated for Best Pop Performance by a Group or Duo. It still remains a staple in my life when I need a good lets jump around on my bed like five year old, or reminiscing on the days my college roommate and I would totally lose it when this song came on while we were studying. Who could forget artists like Blink 182 with their fast talking, guitar pushing, and totally crazy lyrics in songs like The Rock Show or when they got super serious in others like Stay Together for the Kids or I Miss You. Blink 182 hit a high commercial success from 1999 to 2004 and even though they have broken up (yet again) I’ll never forget my teenage obsession I came to have with songs like What’s My Age Again or All The Small Things. 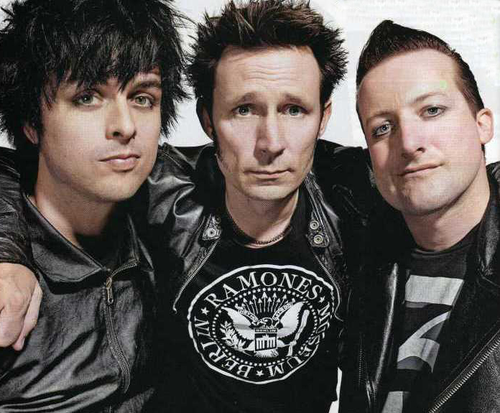 The band of my high school school career has to be and will always be Green Day. Now all you punk rock fans out there are going to say they didn’t come out in the early 2000s. Yes, I know they came out with their break through album back in 1994 and formed in the late 1980s, but they finally received the nod they deserved from the public and the music industry in 2004 when they released the rock opera that is “American Idiot.” It debuted on the Billboard Charts at #1 and was the first of their albums to reach number one. It won the 2005 Grammy for Best Rock Album and it went on to become a Broadway hit. Their is no way I could pick just one song from that album as my favorite, but if I had to chose Jesus of Suburbia takes my vote. It is a nine minute song set in five part story of someone’s life spinning out of control, lost in having nothing to believe in, to care about. You can hit that wall whether you are a teenager or an adult. It just becomes easier as an adult knowing that it is not the end of the world when something doesn’t make sense. Your failure is not what defines you. It is how you stand back up from the fall that helps you find the boulevard you chose to be on. Click here for the perfect early 2000 punk-rock playlist.